Sixers guard Ben Simmons passes the basketball against the Los Angeles Clippers on Saturday, February 10, 2018 in Philadelphia. 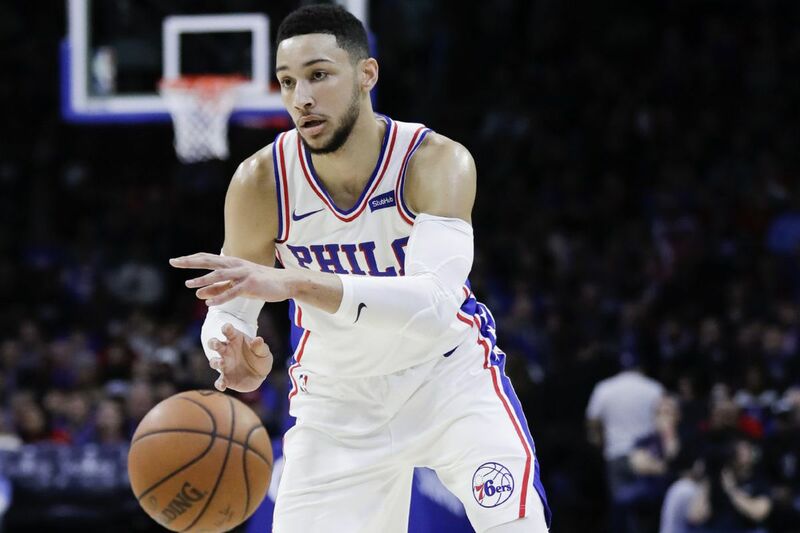 LOS ANGELES – The more Ben Simmons plays, the louder the comparisons to Hall of Famers Oscar Robertson and Magic Johnson become. The 76ers rookie point guard posted his sixth triple-double on Wednesday with 18 points, 12 rebounds and 10 assists. In doing so, Simmons became the first player to post at least six triple-doubles in 60 or fewer games since Robertson did it during the 1960-61 season with the Cincinnati Royals. Simmons has played in 54 games so far. Robertson had 21 through 54 games en route finishing his rookie season with 26. Simmons' six triple-doubles are the most by a rookie in a season since Johnson posted seven with the Lakers during the 1979-80 season. "Oscar Robertson, Magic Johnson and then Ben Simmons … that's amazing," Simmons said of the comparisons. "It's kind of surreal. But I want to break those records." While it means a lot to get statistics, the 6-foot-10, 240-pounder said winning is more important to him. Simmons said he knows that he's not close to living up his potential. So far, he's known for his passing and ability to get to the rim. There's a thought that the 21-year-old will be unstoppable if he can make a consistent jump shot. "I feel like I'm just getting started," Simmons said. "This is my first  games. So for me, it's kind of scary." Utah Jazz shooting guard Donovan Mitchell and Simmons are the leading candidates to win the NBA rookie of the year award. Like Simmons, Mitchell is on his way to becoming a household name to NBA fans. Yet Mitchell gave Simmons the ultimate compliment during Friday's Rising Stars media availability. That exhibition game pits 10 first-and second-year NBA players from the United States against 10 first- and second-year players from around the world. Mitchell, who is playing for the U.S. team, was asked which player, other than him, is going to be "next up" in the NBA All-Star Game. He chose Simmons, who, a native of Australia, played for the world team. "I'm going with probably Ben," Mitchell said of Simmons. "He's talented. He's close to being an all-star this year. He's really talented and can do a lot of things that a lot of rookies can't. He's instinctive. He knows the game. He knows how to get his teammates open and knows what to do." Asked the same question, Simmons picked teammate Dario Saric, who joined Simmons and Joel Embiid on the world team. Mitchell is averaging 19.6 points, 3.5 rebounds, 3.5 assists and 1.5 steals while shooting 35.4 percent on three-pointers. He's scored 40 or more points on two occasions this season. "He's really good." Embiid said. "I like his game. He's athletic. He can score the ball [and defend]. I like his game a lot." The all-star center, who is also competing in the Rising Stars game, just doesn't like Mitchell enough to endorse him for rookie of the year over Simmons. Simmons is averaging 16.4 points, 7.8 rebounds, 7.3 assists and 1.9 steals for the Sixers (30-25), who are in seventh place in the Eastern Conference playoff race. "We're in the playoffs race, and his numbers are insane, and he's been helping us a lot," Embiid said. "So I feel like there's no question. He should win rookie of the year."